Clonal plant species differ greatly in architectural plasticity. Plasticity mechanisms: When the details matter. Carlos L. Ballaré, IFEVA, Dept. de Ecología, Facultad de Agronomía, Universidad de Buenos Aires, Argentina. Individual plants acclimate to (and sometimes anticipate) variations in their biotic and abiotic environment using a host of information-acquiring systems. These systems sense informational signals, activate the relevant molecular circuitry and ultimately elicit plastic changes in gene expression and protein function. Plastic responses are continuously implemented in the plant and serve a number of functions, including the maintenance of metabolic homeostasis, foraging for resources, and defense. In most cases plastic responses involve metabolic as well as morphological and developmental components. Therefore, classifying plants as plastic or non-plastic may be risky. Plants from harsh environments may show little morphological plasticity to, for example, light quality variations; however, chances are that they appear to be extremely plastic if one chooses to look at their metabolic responses to rapid variations in nutrient availability. Although it is not uncommon in ecology textbooks to describe plant responses to environmental stresses as inevitable consequences of limitations or imbalances in the resources available to the plant, it is seldom pointed out that these responses are based on finely-tuned and coordinated information-transduction cascades, and do not necessarily represent the only possible solution to the resource conflicts presented by the environment. Plastic responses are triggered by a variety of signals, including things that are frequently considered only in terms of their energetic value or deleterious effects. Thus, signals that engage specific response programs include: (1) specific external clues (such as changes in the red:far-red ratio, biotic elicitors, etc. ), (2) variations in the amount of resources available to the plant (e.g., incident PPFD, hexose level in a particular tissue, etc. ), and (3) products of cellular damage (e.g., DNA lesions, free radicals, etc.). Any molecular mechanism that is capable of extracting information from 1, 2, and 3, and transforming that information into a potentially useful plastic response, should be expected to be under continuous selective pressure. There is growing evidence indicating that different environmental and biotic factors can induce convergent information-transduction chains, which lead to similar plastic responses. For example, plastic responses to several stress factors (chilling, UV, water stress) may involve free radicals as messengers and result in the induction of antioxidant enzymes and enzymes of the phenylpropanoid pathway. It is therefore at least possible that a good part of the molecular circuitry that allows the plant to acclimate to fluctuations in a given environmental factor may have been selected under the combined influence of various environmental factors. Frequently, the functional details of the mechanisms that allow plants to sense and react plastically to changes in their environment tend to be ignored or overlooked in descriptions of plant responses to competition or to abiotic stresses. Some of the limitations associated with the use of very simple models of plant function will be discussed. For example, it is clear that competition models that are simply based on resource consumption cannot account for plastic, active morphological responses of the plants, which in many environments are critical for the outcome of competition. Similarly, the lack of a mechanistic description of plastic responses to environmental factors will make it difficult to understand why there is cross-acclimation to disparate stress sources, and will certainly limit our ability to design fruitful experiments to understand how plants cope with environmental variation. Graham Bell, Department of Biology, McGill University, Montreal, Quebec, Canada. rates of growth in pure culture. nutrient pulse acquisition will be discussed. Dan Cohen, Department of Evolution, Systematics and Ecology, The Silberman Institute of Life Sciences, The Hebrew University of Jerusalem, Israel. Stanford University, Stanford CA, USA. feedback (learning) from the consequences of the responses. feedback or reinforcement by the consequences of the response or the action, i.e. correlated with the subsequent outcome. population are exposed to different unpredictable environmental conditions. a. Increased predictability of environmental conditions and changes. c. Decreased availability of effective correlations and signals. of different individuals that have been exposed to similar events. responses of different individuals that have been exposed to similar events. negatively correlated with the change in fitness cause a negative reinforcement. event, a response, and the reinforcement, which provides positive reinforcement for investing time and effort in collecting more information. correlation structure of the environment is usually stronger, and the internal uncertainties within each individual usually decrease for shorter time intervals. Thus, reinforcement and the associated fitness would increase by collecting more information and delaying the decisions. usually includes irreversible developmental processes. Thus, the decisions at some early stage necessarily constraint the future development of that individual at later stages. Representative examples of the three types of strategies are discussed. 1Department of Terrestrial Ecology and Nature Conservation, Agricultural University, Wageningen, 2Department of Ecology, University if Nijmegen, Nijmegen, The Netherlands. The length responses of clonal spacers such as rhizomes and stolons are discussed as examples of morphological plasticity. Manipulative experiments show that the phenotypic expression of spacer length is the result of an inherent developmental plan in interaction with the environment. The very nature of the developmental pattern may result in considerable developmental noise (non-plastic variation) which constrains the occurrence of plasticity. As a rule, plasticity in spacer length and other forms of morphological plasticity in clonal plants are expressed within a single genetic and physiological individual. Plastic responses by ramets may be enhanced if they are interconnected to ramets of the same clone that experience other conditions. There are even examples that show that local morphological responses occur in integrated clonal individuals only, so that the occurrence of plasticity is confined to a single individual. As clonal individuals are long-lived they are likely to experience a variety of conditions throughout their life-time. Plastic adjustments in morphology are ubiquitous throughout, and are likely to play a crucial role in the persistence of clones. The picture that emerges is one of morphological plasticity as a prevalent feature of the life history of clonal plants, constrained by the developmental plan of the species. The implications for the evolution of plasticity are discussed. The evolutionary theory of plasticity as developed for unitary animals may not apply to clonal plants or even to all plants as modular sessile organisms. species, and types of environments, or in complex ways involving all three? harvested 7 and 21 days after emergence. greater range of response as well as larger mean values. Low level stress, such as from salinity, heat or pathogens, has been reported to increase plant tolerance to later exposure to higher stress levels. This is often correlated to an increase in dark respiration. Suppression of dark respiration, by high concentrations of ambient carbon-dioxide, sometimes increases carbon gain, in low stressed plants. However, we have found that this suppression is followed by a reduced tolerance of subsequent, higher levels of stress. It is tentatively concluded that the increased rate of dark respiration (especially maintenance respiration) measured in low stress challenged plants, is a result of the induction and maintenance of energy-consuming, feed - forward, stress adaptation mechanisms. Mordechai Gersani & Omer Falik, Department of Life Sciences, Ben-Gurion University of the Negev, Israel. was exposed to intraspecific competition with roots of 1-4 plants, while in the counterpart compartment the root was free from competition. We also run experiments in which both root were exposed to 1-4 competing roots. slightly and insignificantly in response to increased density of competitor plants. When competition was present in both sides of the fence-sitter, the total root biomass and the fitness of the fence-sitter was inversely proportional to the root biomass of the competitor plants. The success of the fence-sitter plant to reach high constant fitness can be explained by the plastic distribution of the roots according to the density of competing roots. It can be concluded, therefore, that plastic development allow pea plants demonstrate a micro-habitat selection. Thomas J. Givnish, Department of Botany and The Institute for Environmental Studies, University of Wisconsin, Madison WI, USA. vs. lamina, and ability to maintain a positive carbon balance at different depths. The different patterns of petiolar plasticity in emergent and aquatic plants appear adapted to the different mechanical stresses (compressive vs. tensile) each growth form experiences, and appear to generate fundamental gradients in the structure and composition of aquatic communities. cybernetic cost, gene flow, and spatial variation in selection pressures. Dependence on particular signals or cue correlations may show little evolutionary lability within lineages. Congeneric species of forest herbs, for example, show little variation in leaf or floral phenology; the high cost of leaf and stem construction, together with seasonal variation in photon flux density, may be responsible for the origin of several phenological guilds on fertile sites, and the exclusion of all but those with those most long-lived leaves on infertile sites. Studies of adaptive radiation should include common-garden experiments, to ascertain that phenotypic differences between species in different ecological roles reflect genetic differences, not a shared pattern of developmental plasticity in the face of different environments. Timothy Griffith, Department of Biology, Indiana University, Bloomington, Indiana, USA. required for fruits to mature may represent a different essential trait. are possible response traits for these essential traits. range limiting traits of cocklebur. Philip Grime, Unit of Comparative Plant Ecology, University of Sheffield, Sheffield, UK. The objective in this presentation will be to review the insights available from an unpublished comparative database on the plasticity of roots and shoots of forty-three widely-contrasted vascular plant species. The results suggest that used in conjunction with other standardised data, measurements of the scale, precision and rate of plastic responses can provide the basis for 'scaling-up' to plant community and ecosystem properties and responses to perturbation. Yitzchak Gutterman, The Jacob Blaustein Institute for Desert Research and the Department of Life Sciences, Ben-Gurion University of the Negev, Sede Boker Campus, Israel. portion of the species' seed banks will be lost. microhabitat during the germination process. development and maturation which affect the plasticity of seed germination. inflorescences or on the plants, during maturation. 3. Regulating mechanisms of synaptospermy and seed dispersal. 4. Post maturation factors, such as temperatures affecting afterripening. position and location of inhibitors. banks germinate in the right microhabitat after a suitable rain event. 2Dept. of Plant Taxonomy and Ecology, Eotvos Lorand University, Budapest, Hungary. horizontal) and temporal distribution of patches of different environmental quality. Grasslands form structures which are patchy at the fine scale; this patchiness is largely caused by the presence of the species themselves, and therefore itself has a rather high rate of change in time. We used a clonally growing grass species, Festuca rubra, in a mountain grassland, as a model system to examine the field relevance of the plastic response of clonal growth to the quality of the local environment. rhizomes are present or absent). Existing data suggest that these growth forms may be environmentally induced. the growth rate and the tussock diameter of F. rubra. * F. rubra tussock density may be a plastic response to local environmental heterogeneity due to neighbour presence and density around the tussocks. * Under which types of environmental spatio-temporal structures the plastic growth would be favoured relative to the non-plastic behaviour? * Horizontal spatial light distribution in the system and its relation to density of individual plant species and to overall abobeground biomass in the field. * Plant response to the light levels observed in the field (in a growth chamber). interaction in the tussock density. * Plant response to field conditions using implant experiment. Plants multiplied in culture were implanted back to their original locality to sites that differed in differed in species that were present as neighbours, in densities of these species and in fertilisation levels. Four clones were used to assess variation in the response between genotypes. Again, there were both overall plastic responses and a GxE interaction in the tussock density. * A (strategic) spatially extended model is being built to determine which (and to what extent) spatio-temporal structures of the environment favour the plastic types compared to non-plastic ones. Heidrun Huber, Department of Plant Ecology & Evolutionary Biology, Utrecht University, The Netherlands. respond differently to environmental signals. plasticity in clonal and in erect species, respectively. petioles were measured after 5 weeks of growth. related to the degree of environmental predictability. Michael J. Hutchings, School of Biological Sciences, University of Sussex, Falmer, Brighton, Sussex, UK. Resource distribution is spatially and temporally heterogeneous in all natural habitats, and heterogeneity can have a variety of forms. The impact of heterogeneity on plants depends on the form in which it is presented, and this talk will draw on experimental results to demonstrate that some forms of heterogeneity are more "visible", and provoke much larger plastic responses from plants, than others. The effects of providing fixed quantities of resource in different spatial and temporal configurations will be discussed using results from experiments on both clonal and non-clonal species. It will be shown that, in heterogeneous environments, both local and whole-plant responses in the clonal herb Glechoma hederacea (Lamiaceae) are sensitive to the scale of patches of different quality, and to contrast in patch quality. This is manifested in (i) differences in the ability of the species to preferentially exploit the better quality patches of the environment, (ii) localised differences in morphology, reflecting differences in resource-acquisition activities which are related to local resource availability, (iii) ontogenetic changes in the development of modules. These phenomena culminate in wide variation in whole-clone yield between treatments despite the provision of identical quantities of resources in all cases. Comparisons of clone growth in environments providing the same quantity of resource overall, but with different degrees of contrast between good- and poor-quality patches, show that as contrast declines, greater use is made of the poor-quality patches of the environment. This is accompanied by a reduction in the extent to which localised differences in morphology are expressed. The effects on morphology and yield of several non-clonal species, when a fixed quantity of resource is provided in pulses which differ in duration and frequency, will also be discussed. Jaime Kigel, Department of Agricultural Botany, Faculty of Agricultural, Food and Environmental Sciences, the Hebrew University of Jerusalem, Rehovot, Israel. a- during initial stages of axillary bud growth: early and autonomous determination of bud fate vs. labile patterns of bud development influenced by the environment. b- at later stages of growth, involving shifts in rhizome and stolon responses to environmental cues, with concomitant changes in their geotropism and morphology. 1- the developmental plan for rhizome production and shoot growth is predetermined and independent of the environment (autonomous development). The case of Ruscus hypophyllum L..
2- Inherent positional morphogenetic gradients within the individual shoot determine the fate of its axillary buds, i.e. to develop into an erect shoot or a rhizome. Basal, first activated buds develop into rhizomes. The positional gradient also regulates the competence of the ensuing rhizome to respond to environmental or endogenous signals affecting its transition into an erect shoot. Developmental plasticity of the rhizome is modulated by temperature. The case of Sorghum halepense (L.) Pers. 3- The developmental program for rhizome and stolon production is very plastic. The resulting plant architecture is determined mainly by variation in environmental conditions. Transition forms between rhizomes and stolons are frequent. The case of Cynodon dactylon (L.) Pers. The adaptive value of these patterns of rhizome and stolon development will be discussed in terms of timing of resource allocation to clonal vs. seed reproduction, and as a function of temporal habitat stability and spatial heterogeneity. 2Institut für Botanik, Technische Universität Darmstadt, Germany. 3Institut fur Umweltwissenschaften der Universitat Zurich, Switzerland. different effects on the species-specific allocation patterns. actually reduce growth and yield. providing the remaining plants with double space in all directions. indicating that the hypocotyl is a high-priority organ for allocation. improving yield of the hypocotyl. evolutionary trend in the phylogeny. of the evolution of plant function, including adaptive plasticity. mislead our inquiry into the evolution of whole plant function. species of known phylogenetic relationships. Christopher Lortie and Lonnie Aarssen, Department of Biology, Queen’s University, Kingston, Ontario, Canada. Adaptive plasticity in plants is commonly interpreted for fitness estimates like size and fecundity. The specialization hypothesis however predicts that plasticity in such characters is not a product of selection, but rather, a product of specialized (i.e. ecotypic) adaptation to particular environmental conditions. In response to a recent test of this hypothesis (Emery et al. 1994), we refine its predictions to recognize that the evolution of specialized ecotypes may be accompanied by an increase, decrease or no change in the plasticity of size or fecundity. These predictions depend on whether specialization is associated with the less favourable or more favourable end of an environmental gradient, and on whether specialization to one end of the gradient comes at a cost of reduced performance at the other end. We argue that, for size or fecundity characters, a plastic response to environmental deterioration is adaptive only if the alternative is dormancy or death, and is generally less adaptive than phenotypic stability. Based on analysis of reaction norms for reciprocal transplants, we illustrate how it is possible to reject the specialization hypothesis and how to recognize results that are consistent with this hypothesis. Ariel Novoplansky, Institute for Desert Research, Ben Gurion University, Sede-Boker Campus, Israel. Allocation of resources to newly developing organs depends on both the actual availability of the limited resources and the probability that these organs will successfully complete their life cycle. A central question is, what are the environmental factors and the internal controls that govern the hierarchies and sizes of newly developing organs. Many plant organs are comprised of smaller functional units. For example, first-order branches would be functionally meaningless without their photosynthetic leaves. In this example there are two morphological hierarchies which are structurally and functionally nested within each other. Such hierarchical construction can be readily found in both the vegetative and the reproductive structures of most plants. While allocation to relatively small organs allows swift materialization and low risk of invested resources, the development of relatively large organs allows greater efficiency in the vegetative or the reproductive expansion of the plant. The size of the developing organs thus represents an inherent trade-off between efficiency and risk in resource utilization. According to these considerations, it is expected that the determination of the hierarchy and the size of any given organ would not only depend on resource availability and the vigor of the plant but also on its evolutionary background (e.g. general probability of catastrophes), and on information concerning its specific environment (e.g. time left to the end of the season, probability of future competition, and probable future availability of limiting resources). It is suggested that in addition to allowing plants their exceptional modularity, plasticity of developmental hierarchies allows plants better control over the efficiency and the risk of their developmental moves. Beàta Oborny, Department of Plant Taxonomy & Ecology, Lorand Eotvos University, Budapest, Hungary. alternative rigid strategy. Therefore, we can expect that adaptation by plastic development is feasible only in a limited range of habitat types, where the temporal variation is intermediate. of any plastic response is the quantitative match between the spatio-temporal patterns of the inductive and the selective factors in the environment. As an example for measuring this match, I present a method from information statistics. This method directly enables the quantification of predictability of the environment. influenced the selective advantage of plasticity over rigid growth. Czech Republic, Pruhonice, Czech Republic. Red/far red (R/FR) ratios are important environmental signals affecting both individual plant behaviour and organization of whole communities. R/FR perception enables individual plants to recognize their neighbours and forage for canopy gaps. In grasslands, light patches are fine-grained. Since most of the grassland species are spreading clonally by means of stolones or rhizomes, the size of their ramets often exceeds the size of the light patches in their environment. Such plants are therefore expected to be highly sensitive to R/FR ratios. In the current study I tested the spectral responsiveness of Festuca rubra which is one of the dominant species of the mountain grasslands of the Czech Republic. When exposed to lowered R/FR ratios, selected clones were found to differ in a) Number and size of tillers, b) Size and architecture of rhizomes, c) Size and architecture of roots. The fact that the below-ground organs responded to light quality implies shoot-root communication of unknown nature. of several environmental factors affecting above- and below-ground organs. The study provides evidence for a rare interaction between signals perceived by the shoots and developmental responses of roots which could influence acquisition of soil resources. Massimo Pigliucci and Hilary Callahan, Departments of Botany and of Ecology & Evolutionary Biology, University of Tennessee, Knoxville TN, USA. and theoretical effort in the field during the last two decades. interdisciplinary field of phenotypic plasticity studies. permit testing of adaptive hypotheses generated by field studies. different but related aspects of the environment. system Arabidopsis thaliana and its close relatives. developmental alternatives (Sans and Masalles, 1994)? different times and conditions excluded any effect of a critical photoperiod. rather than dimensions of their cells. extend the time during which the same leaves supported the reproductive effort. was more or less constant, and similar to that formed on the main plant axis. to starting its own "node counting", forming as many nodes as the original axis. branching was a candelabra of yellow capitula. number of nodes formed before the initiation of the first flower primordia. implications and its relation to developmental plasticity. the roots and a "rejuvenation" of the counting device. are central expressions of phenotypic plasticity. Amir, S. and Cohen, D. 1990. J. theor. Biol. 147, 17-42. Sachs, T., Novoplansky, A. and Cohen, D. 1993. Pl. Cell Env. 16, 765-770. Sans, F. X. and Masalles, R. M. 1994. Can. J. Bot. 72, 10-1. The nature of how phenotypic characteristics are integrated is of fundamental interest to evolutionary biologists, and increasing effort has been invested in examining this issue using organisms that develop in relatively constant environments. Little attention, however, has been focused on how this is accomplished when the organism, depending upon conditions, ‘chooses’ among multiple developmental pathways. In the workshop, I will take the following approach. First, we will step back and ask what the fundamental issues are, taking a mechanistic, developmental perspective. Second, I will briefly discuss the conceptual approaches taken to examining integration, most notably genotype-phenotype mapping and quantitative genetics, and point out their pros and cons. Finally we will look at some actual data sets derived from plasticity studies to examine questions relating to both the inputs and outputs of studies to examine plasticity integration. Bernhard Schmid and Diethart Matthies, Institut fur Umweltwissenschaften der Universitat Zurich, Switzerland. Johanna Schmitt, Susan Dudley1, and Kathleen Donohue, Department of Ecology and Evolutionary Biology, Brown University, Providence RI, USA. 1 Present address: Department of Biology, McMaster University, 1280 Main Street West, Hamilton, Ontario L8S 4K1, Canada. We are using shade avoidance responses in the North American annual Impatiens capensis as a model system for investigating the adaptive evolution of phenotypic plasticity. Natural populations of this species occur in sites ranging from forest understories to full sun, and seedling densities are highly variable, ranging up to 3000/m2. Plants exhibit dramatic phytochrome-mediated stem elongation and other shade avoidance traits in response to intraspecific competition. Selection on these traits is density dependent. Plants expressing the shade avoidance response have high relative fitness in dense stands due to direct selection on height, but low relative fitness at low density due to some intrinsic cost of the shade avoidance phenotype unrelated to height. Greenhouse experiments have revealed significant within-population genetic variation in responses to density and R:FR, suggesting the potential for reaction norms to evolve in response to such selection. We have also observed ecotypic differentiation in shade avoidance responses on a fine spatial scale between populations from open and woodland. Genotypes originating from an open site, where R:FR is a reliable cue of neighbor competition, are less responsive to simulated foliage shade than genotypes from woodland sites, where R:FR is lowered by the forest canopy. To test the hypothesis that this population differentiation is adaptive, we performed a reciprocal transplant experiment in which inbred families from an open and woodland population were planted into both sites in both high and low density. We could thus measure plasticity of shade avoidance traits and fitness to density and to site characteristics (such as overhead canopy) independent of density. We will report the results of phenotypic selection analyses to test the hypothesis that local adaptation is attributable to direct, site-specific selection on shade avoidance traits. Genotypic selection analysis will allow us to examine selection on family reaction norms in each site, and to test the hypothesis that there is a maintenance cost to this form of plasticity. Building upon "A framework for plant behaviour"
Jonathan Silvertown, Department of Biology, The Open University, Milton Keynes, UK. capabilities to respond to them (Annu. Rev. Ecol. Syst. (1989) 20: 349-366). Harry Smith, Department of Biology, University of Leicester, LE1 7RH, UK. Plants exhibit a high degree of plasticity in their responses to signals from the light environment. The perception of light signals is mediated via photoreceptors, and the phytochromes are the best characterised of all plant signal-transducing photoreceptors. The phytochromes exemplify, par excellence, the concept that functional plasticity depends upon pluralistic perception mechanisms and flexible response systems. Based upon the current fixation for Arabidopsis as the role model, the phytochromes are encoded by a diverse family of five PHY genes, PHYA, B, C, D and E. Surveys of a large number of angiosperm families indicate that PHY gene families similar to that of Arabidopsis are present in most, probably all, flowering plants (Matthews et al, 1995). Within Arabidopsis, the phytochromes share some highly conserved domains, including those involved in chromophore binding and in dimerisation, but there are also highly divergent regions. The apoproteins of phyB and phyD are more similar to each other (ca 80% amino acid identity) than they are to phyA or phyC (ca 50% identity), whilst phyE is somewhat closer to phyB and phyD than it is to phyA and phyC. The picture, therefore, is of a family that has diverged substantially throughout evolution, but which retains highly conserved elements crucial to function. The functions of the phytochromes may be conceptually regarded as being two-fold; they detect light stimuli and they evoke specific responses. In other words, each phytochrome has both a sensory and a regulatory function, and it is logical to propose that the two functions reside in different portions of the molecule (Quail et al, 1995). As far as is known, all the phytochromes bind an identical chromophore (a linear tetrapyrrole that absorbs maximally in the red and far-red spectral regions) so that each phytochrome is presumably capable of detecting signals of red and far-red radiation. The regulatory functions are, however, different and considerable effort has been expended recently to identify the physiological functions of each phytochrome in Arabidopsis. The view is emerging that the phytochromes use common light signals to evoke varying responses that are individually important at different stages of development (see Smith, 1995 for review). The existence of multiple photoreceptors allows a flexibility of response that could be described as plasticity. Because there may be overlap, co-operation and even conflict between the roles of the different phytochromes, the outcome of specific signal-response events may not be readily predictable; in other words complexity leads to unpredictability. Unpredictability seems to be the principal characteristic of what we like to call plasticity. The most powerful approach to identifying the functions of individual phytochromes is through the selection of mutants. In Leicester, we now have lines of Arabidopsis that have genetic lesions in each of the PHYA, B, C, D, and E genes. Surprisingly, only the phyB mutant shows a marked phenotype at the mature plant stage. This means that the lack of individual phytochromes does not necessarily spell disaster. Indeed, the original phyD mutant was the natural ecotype Wassilewskija, or WS, which has been shown by Aukerman et al. (1997) to have a large lesion in the phyD gene, although it survives quite successfully in its own natural habitat. Does this mean that phyD is superfluous? In a sense this may be so, in the same way that to be colour-blind or tone-deaf does not necessarily mean that success in life is impossible, although being so afflicted one would be unwise to try to emulate Michelangelo or Beethoven. The Arabidopsis phytochrome mutants are ecologically disabled, in the sense that the loss of an individual photoreceptor limits the range of environmental light signals to which the plant can successfully respond. Plurality of perception provides flexibility of function. The plurality resides in the gene family. In theory, gene families provide a mechanism for generating plurality that is, from the evolutionary viewpoint, both economical and secure (Smith, 1990). Gene duplication, unequal recombination, domain swapping and mutation collectively provide a mechanism for parsimonious and safe evolutionary experimentation, and we can have no idea how many variants of important genes, such as the phytochromes, have been tried out and discarded through evolution. Teleology apart, the testing of variants within the framework of a gene family is just one example of the benefits of complexity. For the phytochromes, continual refinement of photoregulatory perception through the generation of phytochrome variants capable of evoking new transduction pathways has led to the present pluralistic state in which the various phytochromes are capable of regulating all phases of development from germination to flowering. The phytochromes are a simple family of small size, but they may be regarded as a paradigm of functional plasticity. Gene families are the rule, rather than the exception, in all higher organisms, and it seems inescapable that one of the benefits of the evolution of gene families is the plasticity that they endow. 2Departamento de Ecologia, Universidad Complutense de Madrid, Espana. stoloniferous herbs provide circumstantial evidence for this notion. environmental predictability in resource supply patterns. 1The Institute of Low Temperature Science, Hokkaido University, Sapporo, Japan, and 2Department of Biology, Kyushu University, Fukuoka, Japan. Perennial and annual plants often differ in their allocation to reproduction. While annuals usually allocate most of their assimilates into vegetative growth and switch to reproduction at a later developmental stage, most perennial plants store some proportion of their resources concurrently with their aerial shoot development. This allocation into storage may affect the competition ability of the shoots and consequently the size hierarchy of the plants. We would like to present a simulation model of a shoot growth of a perennial plant in which each shoot consists of a productive part including stems, leaves and a storage organ such as a rhizome or a tuber. Each shoot photosynthesizes and can allocate its assimilate to either parts, but movement of resources among shoots is not allowed. Shoots compete asymmetrically with their neighbours. We considered two cases; (i) allocation of assimilates to storage within a shoot is genetically determined, and (ii) allocation could be altered in a plastic manner, depending on the shoot's surrounding environment. Comparing shoot growth in the two cases under homogeneous and heterogeneous environments, we got the following: (i) Under environmental homogeneity, there were no significant differences between the deterministic and the plastic plants in a mean shoot size and a size hierarchy of the shoot population (ii) Under some heterogeneous conditions, the plastic plant had some advantage over the deterministic one. These results suggest that environmental heterogeneity favours plastic response of resource allocation in a perennial plant. Trifolium repens (white clover) is a common species in pastures throughout the temperate region. It's ability to persist in pastures is largely attributed to its capacity for clonal growth via the lateral spread of stolons. White clover exhibits a guerrilla strategy, a growth form characterized by prostrate growth, rapid stolon elongation and relatively infrequent branching. Each stolon is comprised of numerous ramets (each ramet defined as a node with its associated internode, leaf, and axillary bud) and stolon elongation is a consequence of ramet proliferation. A given stolon can grow longer than 25 cm before fragmentation occurs thereby giving rise to numerous individual ramets, each capable of independent existence. This growth form, combined with the fact that an individual clone (genet) can be long-lived, results in ramets being distributed widely across the pasture. 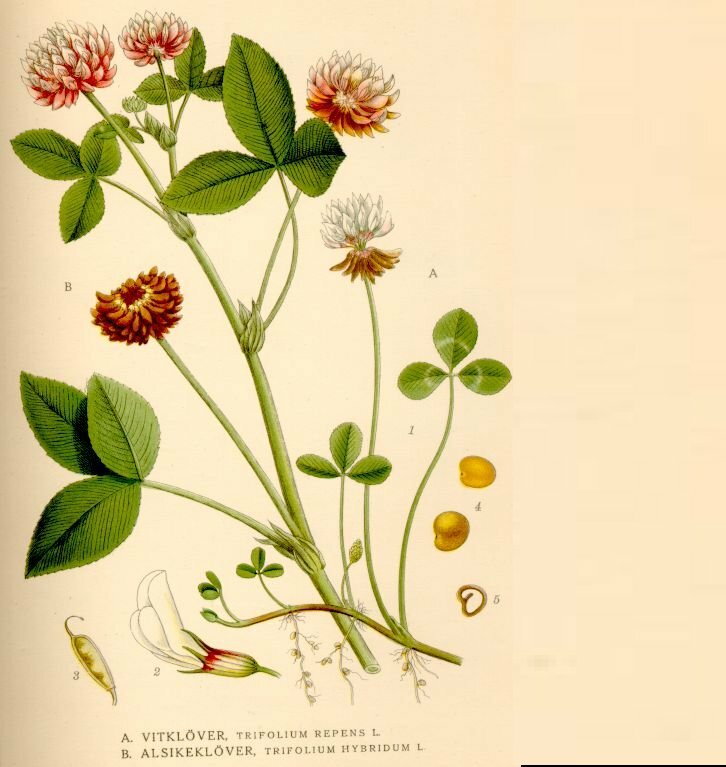 As a clover grows through a pasture it encounters a complex canopy structure. Besides intermittent penetration of sunlight through spaces between leaves, there may be larger gaps that allow penetration of sunlight for longer duration. These larger sunflecks can supply a substantial portion of the energy for a plant's photosynthesis. A plant within a sunfleck will also receive light from the clear sky that has been transmitted through leaves and in many cases, light that has been reflected off plants forming the boundary of the sunfleck. The relative proportions of transmitted, reflected, and unfiltered light will be influenced by biotic (location, identity, and conditions of neighboring vegetation) and abiotic (diurnal and seasonal solar movement, cloud cover) factors. Therefore, the light climate itself can differ in terms of the total light available (light quantity) and/or its spectral composition (light quality). Arguably, one of the main characteristics conferring success on an individual is phenotypic plasticity, the ability to make morphological and physiological adjustments to changes in the environment. To continue growth and gathering of resources, the plant may need to modify its phenotype as it continually encounters the patchiness in its environment. By manipulating the light environment under controlled greenhouse conditions, there is considerable evidence to demonstrate how light quantity and quality affects plant growth and morphology. In many studies, however, shading of target plants is typically accomplished artificially (using synthetic material) and abruptly, and the treatment is usually imposed for longer than the normal diurnal period. This is in contrast to the natural environment where the quality and quantity of light will vary gradually and continuously in space and time. If a plant's behavior is dependent upon the degree of resource depletion, then imposing a sudden depleted condition might evoke responses quite different from those normally exhibited in the field. Whether the standard protocol in light experiments constitutes a reasonable approximation to the natural condition is unknown. Here we report the phenotypic response of white clover to heterogeneous light conditions. In the first experiment, patches of reduced light were imposed artificially and abruptly upon two consecutive ramets (termed first and second ramets) on a stolon. First ramets were either shaded or unshaded, whereas all second ramets were shaded. In a second experiment, neighboring grasses were used to shade basal and/or apical regions of stolons and their effect upon apical growth and morphology determined. A third experiment examined the effect of patchiness due to shading by grasses, and of light reflected from grasses on the growth and morphology of white clover. Long-term exposure to artificial shading (Experiment 1) had no effect upon rooting, branching, or flowering frequencies of first ramets, when compared to the unshaded treatment. However, shaded first ramets had significantly smaller leaf areas, internode lengths, and root and shoot masses, than control ramets, whereas petioles were significantly longer. Second (shaded) ramets had significantly smaller leaf areas and shoot masses when the first ramet was also shaded suggesting an integrated response between ramets. Using the more natural or more realistic treatments (Experiments 2 and 3) produced effects that were more subtle. In experiment 2, shading of the apical region produced no significant change in apical morphology when basal regions of the stolon were either shaded or unshaded. When the apical region was unshaded, however, the light environment in the basal region resulted in significantly reduced branching propensity and total ramet production in the apical region. Shading of the entire stolon (experiment 3) caused a significant reduction in branching propensity, total stolon length, ramet production, leaf area, and shoot mass. Petiole and internode lengths were unaffected by the presence of grasses. There were no significant changes in stolon morphology for reflected versus unshaded treatments. Taken together, these results suggest that (1) severe and abrupt interference of the light environment (experiment 1) can induce significant changes in the growth and morphology of clover stolons, (2) these changes are reduced (or non-existent) when available light is manipulated to create more "natural" conditions, and (3) to determine the ecological implications of this phenotypic plasticity, it will be necessary to obtain an accurate profile in the field of the typical light environment . Do functionally redundant species differ in their phenotypic plasticity? 3University of California, Davis, USA. In any given region, it is possible to separate co-occurring species that have similar roles and effects on ecosystem processes into functional groups. While in certain poor habitats each species is functionally unique, in complex ecosystems like tropical rainforests species overlap in function. Comparative ecology typically considers mean performance of the species compared, and frequently fails to find mechanistic differences among the species. Since habitat conditions are constantly changing, plastic response to environmental variability can be as important as overall performance. We studied phenotypic plasticity in response to light in 16 shrubs species of the genus Psychotria co-occuring in the understory of a tropical rainforest, in order to explore its contribution to the understanding of species function in hyperdiverse environments. Six species were more frequent in forest gaps and the other ten were typically found in the dark understory. Several individuals of each species were grown in three light environments designed to give similar daily photon flux densities to the natural light gradient observed in the forest of Barro Colorado Island (Panama). Average values in each light treatment and plastic response expressed across light treatments were determined for several structural, physiological and growth parameters. When individuals grown under the same conditions were compared, plant performance and mean values for most structural and physiological parameters studied were remarkably similar among the 16 congeneric species. In contrast, species significantly differed in their plastic response to the light treatment. Species that exhibited in the field a preference for brighter environments (small forest gaps) exhibited a higher mean phenotypic plasticity than species frequently found in the darkest areas of the forest understory. We suggest that not only differences in the heterogeneity of the light environment but also on the predictability of the environmental change (gaps always tend to close while gap formation by treefalls is unpredictable) are responsible for the observed differences in phenotypic plasticity. And these differences might have more dramatic implications for survival and might be more ecologically relevant than differences in species performance in a given environment. Phenotypic plasticity seems to be a valuable feature for understanding the different ecological roles in complex habitats of sympatric species that are apparently redundant from a functional point of view. Peter H. van Tienderen and Arjen van Hinsberg, Netherlands Institute of Ecology, Centre for Terrestrial Ecology, Heteren, The Netherlands. expect unfavourable rather than favourable correlations. as a result of the balance between selection/mutation/drift. Succulence: How to combine business with pleasure? Yoav Waisel, Department of Plant Sciences, Tel-Aviv University, Israel. Salt induced succulence is usually described by two traits: by increased size of leaf cells and by an increase in the leaf water content. Succulent plants have several common features: they have thick leaves, large mesophyll cells, small intercellular spaces in the leaves, higher elasticity of the cell walls, highly developed water storing tissues, a relatively small ratio of the outer leaf surface area/leaf volume, lower content of chlorphyll per unit volume and a lower density of the stomata. What causes succulence? Several answers were given to that question. a) Succulence represents a direct response of the plant to a high content of NaCl. b) Succulence results from accumulation of organic acids. c) Succulence develops due to changes in the ionic balance of the leaf cells. d) Succulence development is correlated with an increase in ATP content, induced by an inward sodium transport. e) Succulence is induced by the effects of chloride. Chloride loosens some binding complexes in the walls, and by that enables their expansion and eventually the increase in size of the mesophyll cells. Neither one of the above hypotheses gives a full answer and an alternative suggestion will be presented. Inducible defences against herbivory constitute a form of phenotypic plasticity. Inducible defences are likely to evolve only under those conditions where maintenance of these defences under conditions of low herbivory constitute a significant cost for the plant and where the defence can be produced sufficiently quickly that they can either deter either the current herbivores or at least deter future herbivores, if the current level of herbivory is a reliable indicator of future herbivory. Among a number of general hypotheses of plant defence, the resource availability hypothesis (Coley et al. 1985) and variants thereof is most prominent. This hypothesis states that plants growing in environments with low resource availability should invest in defence at the expense of growth because the cost of replacement of a part that is eaten is high. Conversely, plants growing in resource-rich environments can easily replace a part that is eaten and thus should invest in growth at the expense of defence. This hypothesis explicitly states that plasticity of defence is contingent upon the abiotic environmental context in which the plant is found, and implies that the level of herbivory suffered by the plant is relatively unimportant in determining the degree of defence employed. Similarly, no mention is made of the role of phylogenetic factors in determining the type and level of defence employed. Yet both level of herbivory and phylogeny have been shown to affect defence production. I examine the physical (e.g. thorns) and chemical (e.g. tannins and calcium oxalate) defences of a number of plant species growing in resource-poor environments in Africa and the Middle East in the light of the resource availability hypothesis and competing hypotheses, and compare these results with those obtained from more mesic environments in order to ascertain whether abiotic environmental factors are indeed of primary importance in the plasticity of plant defences. Developmental phenology and the timing of determination of shoot bud fates (clonal and non-clonal considerations). 1Maxine A. Watson, 2Cynthia S. Jonesand and 3Monica A. Geber, 1Department of Biology, Indiana University, Bloomington, Indiana, USA. 2Department of Ecolofy and Evolutionary Biology, University of Conneticut, Storrs, CT, USA. 3Section of Ecology and Systematics, Cornell University, Ithaca, NY, USA. Plasticity is one of the essential features of plant adaptation. It results from the fact that plant growth is modular, which allows alteration in the number, size and function of modules made at different times and at different stages in plants's life histories. To an important degree, the extent of plasticity expressed is a function of the interaction between plants' developmental patterns and patterns of environmental variability. suites of traits, that together comprise the plant's developmental program. Theodore G. Wong, Department of Biological Sciences, Stanford University, Stanford CA, USA. physiological responses to climate change.